What is oyster shell? What is it used for? Oyster shell refers to the inner and outer shell of an oyster (ostrea or ostrea edulis). The outer surface of the shell ranges from grayish-white to yellowish-purple in color, and is depressed or uneven, with concentric scales that emanate from the back of the shell; the inner surface is almost always white and smooth, although the edge may sometimes be purple. The shell contains a variety of vitamins and minerals, especially several derivatives of calcium (calcium cardonate, calcium phosphate and calcium sulfate). Oyster shell has no smell and a gritty, slightly salty taste. In traditional Chinese medicine, oyster shell has salty and cool properties, and is associated with the Liver and Kidney meridians. Its main functions are to calm the liver and suppress overactive yang; tranquilize the mind; arrest discharges and induce astringency; and soften hardness and nodules. It is often used in conjunction with dragon bone and white peony root in Chinese herbal remedies. Research in China has shown that processed oyster shell dissolved in water can reduce the incidence of gastric ulcers. Oyster shell has also been shown in animal studies to revitalize the immune system and shrink the size of some types of tumors. Because of its sedative effects, it is sometimes used to normalize blood pressure and promote sleep. How much oyster shell should I take? The typical dose of oyster shell is 15-30 grams, taken with water as part of a decoction. This dosage can increase or decrease depending on the type of condition being treated. What forms of oyster shell are available? Oyster shell is usually available as a powder and sold in capsule or pill form. Oyster shell decoctions are also available at some Asian markets and specialty stores. What can happen if I take too much oyster shell? Are there any interactions I should be aware of? What precautions should I take? 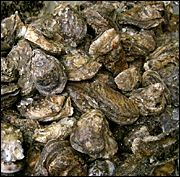 Long-term use or overdose of oyster shell can lead to constipation or dyspepsia. In addition, it should be avoided or used with extreme caution by people who are allergic to shellfish. As always, make sure to consult with a licensed health care provider before taking oyster shell or any other herbal remedy or dietary supplement. Balch JF, Balch PA. Prescription for Nutritional Healing, second edition. Avery Publishing Group, 1997. Carter BB. Addicted to painkillers bought online. Available online. Monda L, Scott J. Golden Flower Chinese Herbs Product Guide. Jin Hua Press, 1997. Tong L, et al. China Journal of Experimental Clinical Immunology 1998;10(5):306-309. Wang K, et al. China Journal of Ocean Medicinal Products 1997;16(1):18-22.